Installing and running nProbe on a host: Host Configuration. 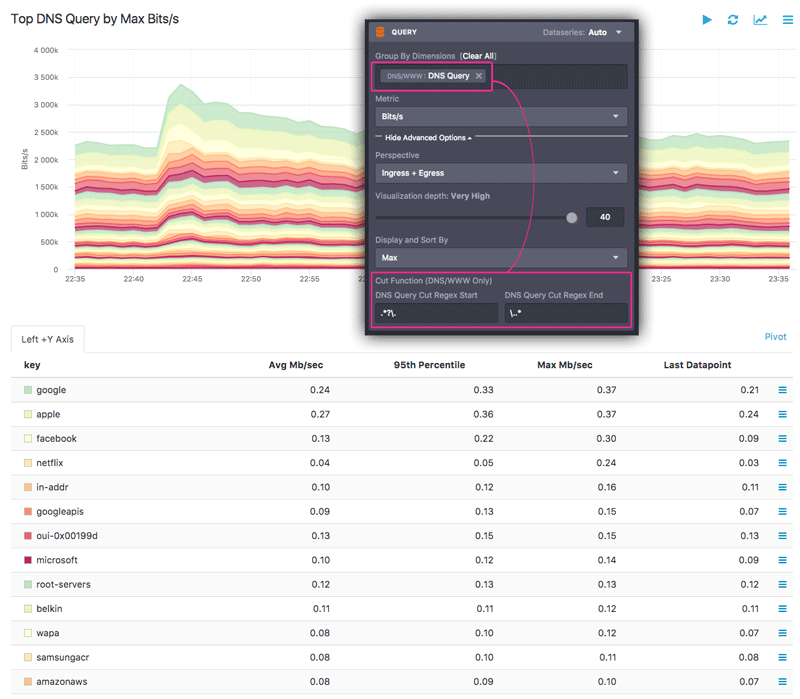 Newly available metrics and dimensions: Host Metrics and Dimensions. 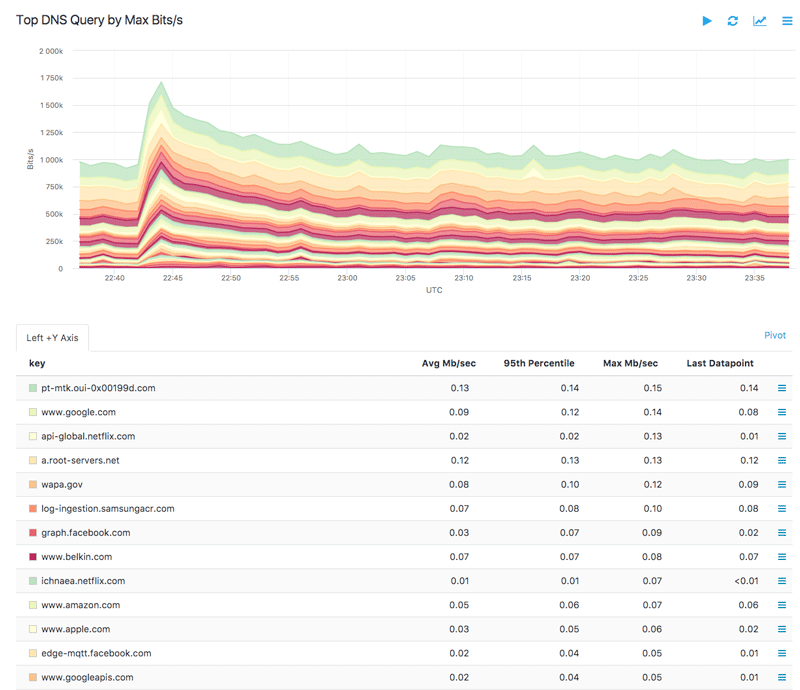 nProbe-based deployments can now query on new Network Performance Monitoring (NPM) metrics (listed at right) in addition to the traditional metrics available from non-host devices (e.g. routers and switches). 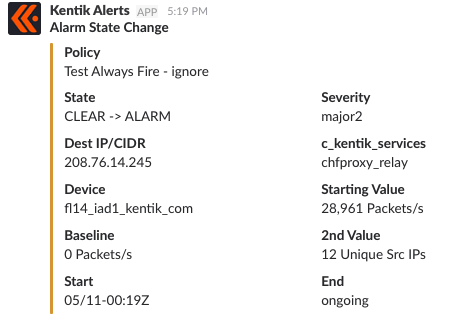 nProbe now communicates natively with the Kentik Detect platform, which means that there’s no need to use the Kentik Proxy Agent (chfagent) for hosts, even in private IP deployments. nProbe now sends traffic data to Kentik Detect using kFlow, Kentik’s own enriched and encrypted flow format. Users running the new nProbe version are now able to query on host-based, application-level group-by dimensions. The initial set of new dimensions, which are related to DNS and WWW, are listed at right. These dimensions are available in the Group-By Dimension selector whenever any selected device is a host (see above). Depending on the specific host dimensions selected to group by, a cut function for DNS/WWW dimensions will be available in the “Advanced Options” section of the Query Pane. This feature allows grouping by regex-matched substrings. In practice this means that you can dynamically pull results for metrics that are broken down by specific string patterns within those dimensions, such as TLD, domain name, specific HTTP Query arguments, or subsets of User Agent strings. Portal: controls access via the Kentik Detect portal. API: controls access via Kentik APIs. Agent: controls access via the Kentik Proxy Agent. Database: controls access via a PostgreSQL client. “Allow All” (default setting for Portal and Agent). “Deny All except,” which enables you to whitelist individual IPs/CIDRS (default for API and Database). 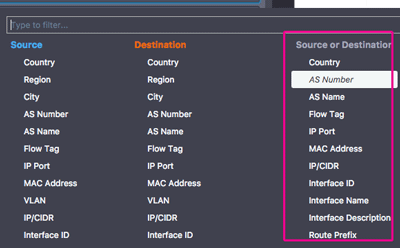 The technique for calculatiing unique source and destination IP counts over multiple selected devices has been updated for improved accuracy. We used to compute the #unique destination IPs for each selected device, for each 1-minute time bucket, then return the max per-device count of IPs within the specified time range. 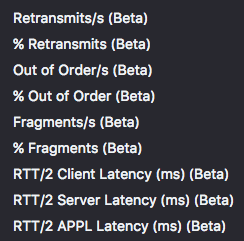 We now get a more realistic result by computing the number of unique destination IPs for the union of all selected devices, and then take the max corresponding to the specified time range. With this new metric you’ll be able to count the number of unique Next-Hop ASNs for a given device. This can be useful to track the number of peers you have on a specific Internet Exchange, as shown below. We’ve noticed that when doing our own spelunking in Kentik Detect we often look up flows against a given ASN or IP/CIDR regardless of whether it’s a destination or a source. That used to require two filters, which could add up to a lot of extra work when stacking filters to narrow a query. So, as shown below, we’ve now provided a whole additional column in the Filter selector with dimensions that match source OR destination. Dimensions with this convenience include Country, ASN, AS Name, Flow Tag, IP Port, Mac Address, IP/CIDR, Interface ID, Interface Name, Interface Description and Route Prefix. We’ve added SNMPv3 to the existing SNMP v2c methods for automated polling of meta-data on your devices. SNMPv3 is a more secure iteration of SNMP and is preferable when your SNMP information will travel over the open Internet (i.e. when you are not directly peered with Kentik’s AS). SNMPv3 adds two layers of security to the v1 and v2c model: authentication and privacy (a.k.a. encryption). When configuring a device, you can now enable SNMPv3 by turning on the toggle. Authentication: Both MD5 and SHA methods are supported. Privacy (encryption): Only 56-bit DES is supported for encryption (AES or 3DES are not currently supported). 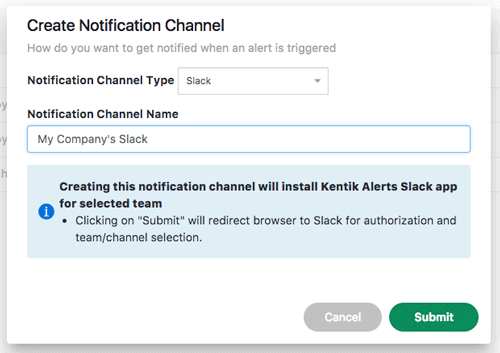 After you set configurations in a series of Slack web pages where you select your Slack Team and the channels to post in, this newly created Notification Channel is then available for use in the thresholds of your Alert Policies. If evaluated over the weekend (Saturday, Sunday), only weekend days in the look-back period will be considered. If evaluated over a weekday, weekend days will be discarded from the loopback. This option can be a life-saver for situations like content networks, where there is a lot of traffic over the weekend and much less traffic on weekdays. Without taking the day of week into account, weekend traffic could set off false positives for alerts that track unusually high traffic. Bi–directional filters (see above): available in alerting too! – a Filter to include or exclude specific packet sizes. View in Explorer: a button on Alert Policy page that allows you to look at the existing, current flow data against which you are trying to build a policy. 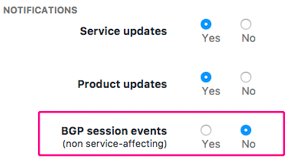 You asked for it: we’ve added a notification toggle for BGP events to the notification setting on the User Profile, which is accessible by clicking your username at the top right of the navbar. 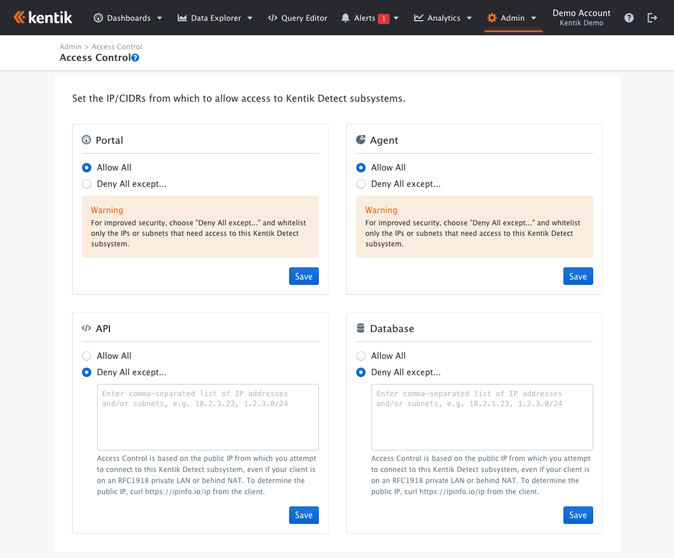 With this setting toggled to “Yes” you will be informed via email of any BGP event on Kentik Detect’s ingest points, including all service-affecting issues. We will continue to notify about BGP-affecting maintenance windows via our usual channels.